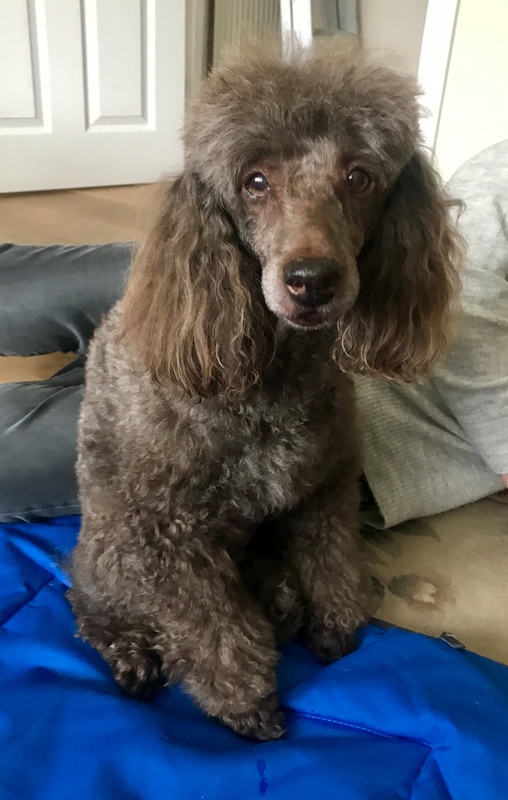 11 year old Miniature Poodle Tilly’s Mum described her issue as ‘creaking’ when she stretches and wondered if she would benefit from maintenance massage sessions. We love terms like ‘creaking’ and ‘ouchy bits’ as they not only perfectly describe what is going on, but describe how it must feel. I often get up from the floor after an hour working with a dog and feel creaky. My knees often get ouchy. Terms like that can bring home the discomfort our dogs might be undergoing. Tilly is quite an anxious dog with people she doesn’t know (she has a short list of OK people) but she sat in my lap shaking slightly. She wasn’t trying to get away at all, but keeping her eye on me just in case. Over the next few minutes the shakes started to subside until 10 minutes in we were like life long besties. No shakes, just sleepy eyes and relaxed yawns. When I went to leave, she was most put out, clambering up my leg to try and keep me behind for more. I think I’m now on her list of ‘nice people’. This entry was posted in acheypaw, achy paws, AchyPaw, achypaw myotherapy, canine myotherapy, dog myotherapy, achypaw myotherapy, myotherapy, achy paws, dog myotherapy, massage benefits, multimodal, multimodal therapy for dogs, myotherapy, not just arthritis, south coast dog massage, south coast myotherapy, therapeutic massage and tagged acheypaw, achy paws, achypaw, achypaw myotherapy, achypaws, Canine massage, canine myotherapy, Dog massage, dog muscle therapy, dog myotherapy, east sussex, massage, south coast dog massage, therapeutic massage. Bookmark the permalink.